There are lots of children on Hill Street, but no little girls Betsy’s age. So when a new family moves into the house across the street, Betsy hopes they will have a little girl she can play with. Sure enough, the moment Betsy meets Tacy, one of the most heartfelt friendships in all of children’s literature begins. 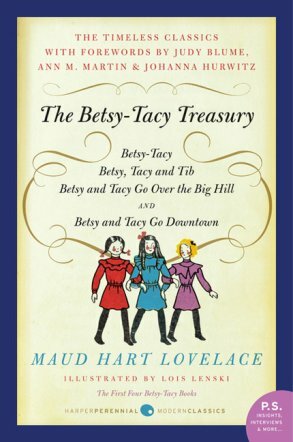 The Betsy-Tacy Treasury brings together the first four books in Maud Hart Lovelace’s classic series: Betsy-Tacy; Betsy, Tacy and Tib; Betsy and Tacy Go Over the Big Hill; and Betsy and Tacy Go Downtown. Tracing the girls’ lives from early childhood to the brink of adolescence, Lovelace illuminates their innocent, mischievous fun and their eye-opening adventures exploring the world around them—from the stories Betsy spins from their neighborhood bench and the sand stores they run in their backyards, to their first experiences at the library, the thrill of the theater, and the sight of their first automobile.